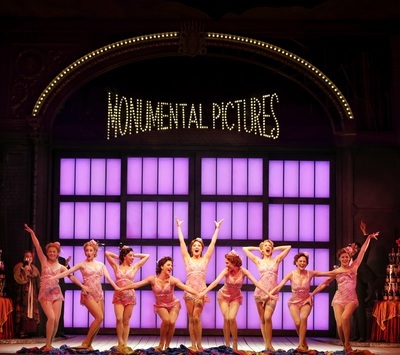 The musical spectacular has stormed into Melbourne, filling Her Majesty's Theatre with plenty of laughter, nifty tap dance moves, and a good hearty sprinkle of old fashioned Hollywood glamour. Singin' In The Rain the musical, is based on the tap-tapping MGM 1956 movie classic of the same name, which starred Gene Kelly and Debbie Reynolds. That scene, which everyone waits for, featuring Adam Garcia playing the lead role of Don Lockwood tap dancing in the rain, is undoubtedly a showstopper in the musical. That said, there are plenty more beautifully choreographed scenes you will love throughout the show. The story follows three fictional film stars of the 1920s; Don Lockwood, Cosmo Brown and Lina Lamont, who must transition from silent movies into the new world of "talkies". It soon becomes apparent, that Lina Lamont's looks alone aren't going to propel her into "talkies" movie stardom, because she can't sing for toffee, and her whiny Bronx voice doesn't match her on-screen beauty. Don meets Kathy Selden, an unknown actress who is not only skilled in theatrical performance, but is a humble beauty matched with a magical singing voice. Don finds his true love, much to Lina Lamont's dismay. 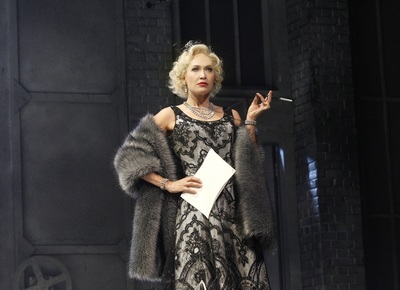 Erika Heynatz, who plays the role of bubble-head blonde bombshell Lina Lamont, is without a doubt, one of the pillars of the Australian Sinin' In The Rain cast. Despite her statuesque beauty, Erika manages to whine out that unmistakable Bronx accent down a tee. Erika carries the ego of Lina perfectly, and makes the audience laugh with her airhead antics. Adam Garcia, has returned to Australia to play the lead role of Don Lockwood; his first speaking, singing and dancing role in 24 years. He is a talented showman, who carries off the unforgettable Singin' In The Rain scene with his fancy footwork. It is here, you will be suitably in awe, or if you're in the front couple of rows .. wet! 12,000 litres of water wash down onto the stage, to recreate arguably the most famous scenes in cinema history. Front row folk, fear not if you're dressed in your best evening attire, you'll be given raincoats to protect you from Garcia's epic showdown. Standout performances also, from Gretel Scarlett who plays Kathy, and Jack Chambers who performs as Cosmo. 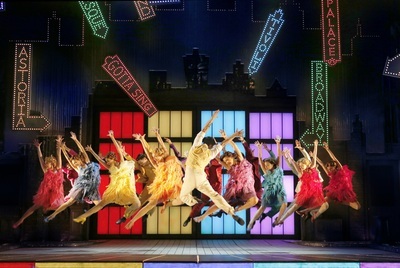 The two stage stars absolutely shine through Singin' In The Rain. 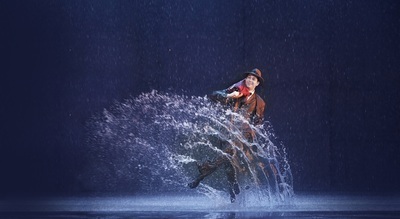 Singin' In The Rain will run until 26 June, 2016, and it's sen-tapping-sational.